The formality of the ceremony is over. Now it's time for fun! 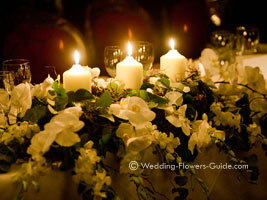 Your wedding reception flowers will give the room a sense of celebration as well as style. The top table is traditionally decorated with a large 'long and low' arrangement in the centre in front of the bride and groom. 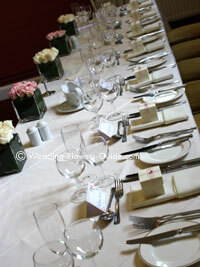 If you have a large number of guests on a long top table you could have three arrangements along the table. In the photo above you can see one I recently created for a bride and groom for a winter wedding. I added candles to give a more romantic look. Below is an example of one of our top table arrangements, we often place them on the registrar's table for a civil ceremony and then move them to the top table afterwards. Another idea for the top table is to run a garland along the length of the table. This can either be arranged in a straight line along the top of the table, or in swags at the front of the table. 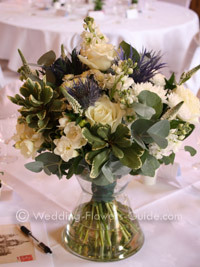 You can also create more contemporary top table arrangements using flower arrangements in glass vases. In the two photos above you can see how I have done this with the small cube vases packed with roses (left) and gerberas in the large goldfishbowls (right). I always used the same color and type of flower for all the wedding reception flowers. 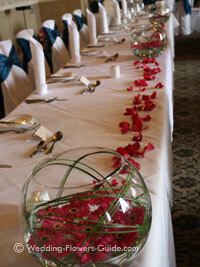 Table centrepieces can set the feel for the whole room, so it is important to get them right. They can range from a simple relaxed low posy arrangements for an informal wedding (photo above left), to sophisticated and ornate tall arrangements (photo above right). Remember your arrangement should not prevent guests from seeing and talking to each other. Either go for low centerpieces that you can see over the top of, or tall thin centerpieces where most of the flower action is high up. 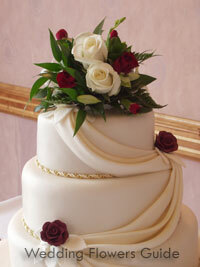 Flower arrangements on the wedding cake can either be small and dainty or large and bold. It depends on the look you are trying to achieve. Small roses of the same colour theme to the bride's bouquet always look good. A design similar to a corsage can be made up and this works very successfully for cakes tops. I created the cake flowers in the photo on the left to give a nice decorative look without overpowering the cake. All of the flowers on the cake top are real including the dark red roses. The two lower dark red roses are actually made from icing sugar, but co-ordinate well. Another tried and tested idea is to have a solid layer of flowers in between the layers of a tiered cake. Obviously do not use poisonous plants or flowers such as holly berries. Also avoid using flowers or foliage that tend to shed leaves or pollen such as asparagus fern. If you don't want flowers actually on the cake you can have a small bouquet of flowers placed on the cake table to the side of the cake. 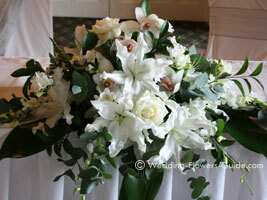 To complete your wedding reception flowers you need some room arrangements. A cost-effective way to decorate the room is to go for a small number of large arrangements. These create a big impact. 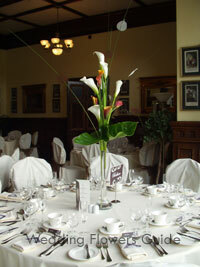 You can place the arrangements on pedestals just as people enter the room or either side of the top table. 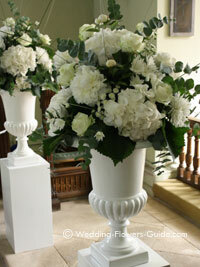 Below you can see two different examples of our pedestal arrangements. The one on the left is on a tradtional metal pedestal stand and the the one on the right is created in the vintage style urns. The arrangement in the photo below is off a large traditional pedestal. That's me standing beside it to give a sense of scale. It contains lilies, gerberas and anthuriums. 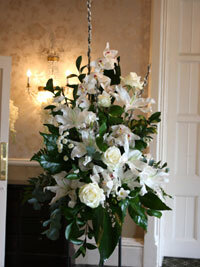 This size of arrangement will cetainly fill any empty spaces in the wedding reception room. Another popular idea is to have an arch of flowers. This is a great idea for the entrance to a marquee. Alternatively you could mark the entrance to a room or marquee by placing a couple of flower trees either side of the entrance.